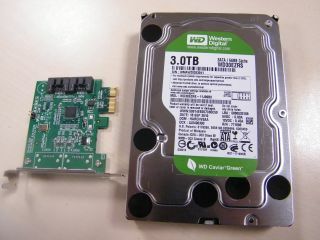 Western Digital has announced the launch of the world's first 3TB hard drive. The WD30EZRS 3TB HDD, costing £195, launches alongside the £155 WD25EZRS 2.5TB drive, and both are available immediately. We're testing one of these three terabyte drives as you read, so expect a full review very soon. This is a big announcement in the world of computing, because until now storage drives have been limited to a maximum capacity of 2.19TB. That's largely due to older operating systems like Windows XP, which use a legacy BIOS and Master Boot Record partition table that can only detect up to 4,294,967,296 logical blocks of storage per drive. With the de facto sector size in most drives being 512 bytes, that leaves your standard HDD with a capacity limitation of 2.19TB (2,199,023,255,552 bytes). The most elegant solution to this problem is to ship new motherboards with built-in UEFI support, instead of old-school BIOS. The UEFI system allows for up to 18 exabytes of Logical Block Addressing - that's about a billion gigabytes. All UEFI-supported motherboards will be able to use WD's 3TB drives both as secondary storage and as bootable drives, but the problem is that there aren't many UEFI-compliant components available yet. And this is where WD has waved its magic wand to come up with an interim work-around. Firstly, before you get excited, if you're still running Windows XP you'd better fetch the tissues now. Windows XP machines are not compatible with these drives, and it's possible that they never will be. WD tells us it's working with its partners to try and come up with a solution, but frankly, it doesn't sound promising. For Windows Vista and Windows 7 users, however, things are a lot more positive. The WD30EZRSDTL 3TB HDD comes with a PCI Express HBA (host bus adaptor) which sits between the drive and your motherboard. Because this PCI-e card has all the latest drivers onboard, it'll bypass your so-last-decade motherboard drivers and enable your (Windows Vista or 7) PC to see all three terabytes of the storage. This HBA card provides a short-term solution until the time when all PCs are UEFI compliant (incidentally, we've spoken to a number of motherboard manufacturers today, and they've all said that a raft of UEFI products is imminent - expect most new mobos to support UEFI from Spring 2011). The practical upshot of all this is that all versions of Windows Vista and Windows 7 will be able to make use of these 3TB drives, through using the HBA card, but only as additional storage. In order to boot the drive, you're still going to need a UEFI-compliant mobo and a 64-bit version of either Windows Vista or Windows 7. This won't be too much of a limitation for PC enthusiasts – the majority of folks who'd want to spend £195 on a 3TB HDD will most likely be booting from a super-speedy SSD anyway – that's just a much more elegant way to set up a system. Having said that, having to use up a PCI-e slot just to get an HDD working might be a compromise too-far for some people. And finally, Mac users with a serious lust for storage have the biggest reason of all to smile at this announcement. That's because all recent desktop Mac systems already use a UEFI-compliant platform, and so WD's 3TB drives will work with desktop Macs right off the bat without a hitch. You'll be able to use the new HDDs either as boot drives or additional storage - yay - although the one big drawback is that Apple Bootcamp is not currently supported - boo. The four-platter (750GB per platter) 3TB WD drive has a formatted capacity of 3,000,592MB and, being part of WD's Caviar Green range, has a power consumption of just 10.75W. Data transfer rate is the same as WD's other top drives - 3Gb per second. So there you go - the 2.19TB limit has finally been conquered. Stay tuned for a full review on TechRadar in the next day or so.